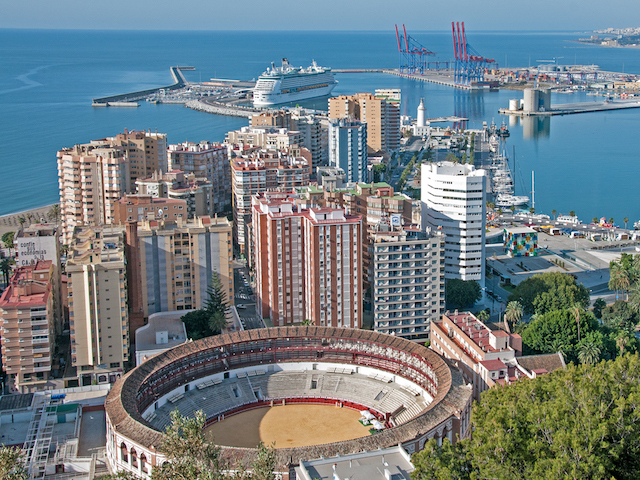 Málaga is an extremely attractive city in its own right yet its role as an airport city serving the Costa del Sol often means that it doesn’t get as many visitors as it deserves. It is perhaps most famous as the birthplace of Pablo Picasso and the museum in his name has proven to be a catalyst in attracting tourists directly to the city. As an historic destination is home to a Roman theatre and a Moorish palace whilst more recent developments have seen a completely redeveloped waterfront which hosts first class shopping and a vibrant social scene. In the Old Town visitors can mix with local ‘Malagueños’ enjoying a beer and tapas at the many lively bars scattered around what is one of Southern Spain’s liveliest destinations. Flights: Málaga–Costa del Sol Airport is the arrival point for millions of visitors heading for their holiday destinations along the Costa del Sol. It lies just 8km south-west of the city. There are incoming flights from all over Europe including ones provided by the continent’s best-known low cost operators. Cruise Ships: Around 750,000 visitors arrive in Málaga port every year on cruise ships to either spend the day in nthe city or head off to Granada to visit the Alhambra Palace. Málaga’s Pablo Ruiz Picasso Airport lies just 8km southwest of the city of Málaga. As the main arrival point for the Costa del Sol it has become Spain’s 4th busiest airport which sees almost 13 million passengers go through its terminals each year. It has many direct flights to countries all over Europe and is very well connected with the United Kingdom thanks to year round services provided by budget airlines especially Ryanair and easyJet which together account for almost 40% of the total traffic arriving in Málaga. There’s a strong seasonal pattern to flight arrivals with many additional services during the summer months. The airport is also well connected nationally by domestic flight operators. Shuttlebus Transfers: The best option is usually to pre-book your Málaga airport transfers before travelling to minimize the hassle on arrival. That’s particularly true for families travelling with children and suitcases! Shuttledirect are well established providers of Málaga airport transfers. They offer a very reliable service with cheap shuttle buses and private vehicles both available. They can cater for all group sizes for journeys to all Costa del Sol destinations as far as Gibraltar in the west and Almuñécar in the east. Public Bus to Málaga: There is an express bus from the airport to Plaza del General Torrijos in Málaga city with several stops including the Maria Zambrano Station, the bus station and the Alameda Principal. The service is called “Linea A Express”, takes about 25 minutes and runs about every 30 minutes. There is also a regular (Line 19) bus which makes a lot more stops and can take close to an hour. Public Bus to Marbella: If you’re heading for Marbella or Estepona there’s a direct bus service operated by Avanzabus that departs from just outside the Terminal 3 arrivals area. Whilst they do offer services to Torremolinos and Benalmadena but the number of hotel drop offs prevents us recommending them unless you don’t mind all the waiting. Long Distance Buses: For longer journeys the Alsa bus company also operates routes from Málaga airport to Seville and Granada. Airport Train Routes: The underground train station in Terminal 3 of the airport connects with Málaga city in one direction and the main resorts of the Costa del Sol as far as Fuengirola in the other. Just four stops away is Málaga RENFE at the Maria Zambrano Station which provides intercity connections nationwide. There are no trains along the coast to the east! Trains between the airport and the city go every 30 minutes and the journey takes 15 minutes. There are trains approximately every 30 minutes heading for Fuengirola with numerous stops including Torremolinos and Benalmadena-Arroyo de la Miel. Taxi Services from the Airport: There’s no shortage of taxis available outside the arrivals area of the airport but as a rule you’ll find that the pre-booked shuttle services listed above offer better rates and the peace of mind of having already paid for your transfer before travelling. Many visitors find that renting a car for collection at the airport is a better deal than booking private transfers and also provides you with transport during your holidays. In this case it pays to book your car rental in advance before arriving in Málaga as you’ll get much better deals online than in the arrivals lounge where on the spot rental deals with the rental companies is far more expensive. The way to get the best deal is through internet car rental brokers. These companies act as intermediaries between the major companies and the customer. By booking with these operators it’s a win/win situation for the broker and the customer as they earn a commission and you get a much better deal than if you go directly to the big hire car companies. Also you get the same car as you would have done had you gone direct. Collecting Your Rental Vehicle at the Airport : Once you’ve collected your luggage start walking to the main exit (salida). Look over to your right and you’ll see another exit for those collecting cars. If you make the mistake of entering the main arrivals lounge you’ve gone too far and should turn around and go back inside the baggage reclaim area and look for the car rental exit. For somewhere that little bit special take a look at the Málaga Gibralfaro Parador which stands on the Gibralfaro hill opposite the ‘Alcazaba’ fortress. It offers views of the bay and the city of Málaga. The spacious, bright bedrooms all have terraces with views of the sea and the gardens. The swimming pool on the roof shares these views and offers a place to relax after a day’s sightseeing. The restaurant offers an excellent selection of Andalusian cuisine with the most popular dish being ‘fritura de pescaítos a la malagueña’ (small fried fish Málaga-style). Located in the centre of Málaga within easy walking distance of the main attractions this hotel is housed in a 19th century building. Inside it is very modern and decorated in an Art deco style. There is a valet parking service which saves the stress of trying to park. It has a roof top terrace which is only open in summer but if you ask you may be allowed up out of season – it is worth it for the magnificent view. This hotel is located near the centre approximately a 5 to 10 minute walk from both the historic area and the main shopping area of the city. It is a new hotel in a peaceful part of Málaga and has a small roof top pool which is very refreshing in the summer after a day’s sightseeing. Free soft drinks are provided in the mini bar which is restocked everyday. Staff are very friendly and helpful. This hotel is located in the centre of Málaga near all the main sites and offers magnificent views of the harbour. There is a roof top pool from which you can look down on the cathedral. The hotel also has a fitness centre with gym, sauna and steam room. The restaurant on the second floor serves a good range of both local and international cuisine which can be enjoyed whilst looking at the Paseo del Parque below. The Málaga Golf Parador offers the perfect location for sun, sea and golf enthusiasts. Based very much on golf it has an 18 hole golf course, a golf school, 3 putting greens and everything that you could need to enjoy a golf holiday. For those keen to take part in other activities there is a tennis court and a wide variety of water sports available too. The spacious and bright bedrooms have beautiful views of the sea, the swimming pool and the golf course. The restaurant offers many typical Andaluz dishes. This hotel is located near the historical centre of the city and only a 5 minute walk from the train station which connects with the airport. The rooms are decorated in a modern style and are well furnished and very clean. All of the bathrooms come with hydromassage bath which helps you relax after a busy day shopping or sightseeing. This hotel is located in the centre of Málaga near all the main attractions. It has its own car park which is very useful in this busy city. All rooms come with a full bathroom, satell¡te TV and a modem connection. This is a clean and modern hotel located in the centre of Málaga close to many bars, restaurants and most of the tourist sights. The rooms are a reasonable size and are well equipped and the staff are friendly and helpful. It is on a busy street and although the windows and shutters block out a lot of the traffic noise it is probably not a great choice for light sleepers. This is a good budget hotel located in the centre of the city near all the main sights. All of the rooms come with full bathroom and satellite TV. There is also on parking available which can save the stress of looking for a spot. For a great selection of deals on city centre hotels in Málaga take a look at Booking.com. 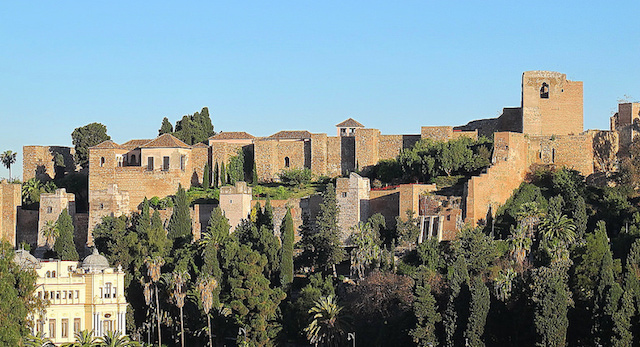 Alcazaba: If you’ll be visiting the Alhambra Palace in Granada during your stay it’s well worth taking a look at Málaga’s Alcazaba first. This Moorish palace lies at the edge of the city centre just off Paseo del Parque and is the greatest remaining monument of Moorish Málaga. It hasn’t been restored to display the beauty of the Alhambra but nevertheless is well worth a visit. After crossing from North Africa, the Moors took Málaga in 713, although the Alcazaba wasn’t built until the eleventh century, then further developed in the thirteeth and fourteenth centuries. With its position on a hill looking over the city and the sea, the building held an important strategic role in the Kingdom of Granada, but its role was both military and residential. Within the grounds of the Alcazaba you will discover elegant patios and fine carved arches, as well as getting great views over the city. Castillo de Gibralfaro: . High above the Alcazaba next to the Parador de Málaga Gibralfaro lie the ruins of an ancient Moorish fortress known as the Gibralfaro. This site has served various defensive roles in protecting the city since it was founded by the Phoenicians around 770 BC. There is a path all the way up following the defensive walls but the climb is severe. Málaga’s ‘hop-on, hop-off’ bus tours stop there if the walk is too much for you otherwise you you could rent a segway for a fun way to take you to the top. Inside there is an interesting military museum and the views down to the bullring and across the city are spectacular. There’s a joint ticket available for the Alcazaba and the Gibralfaro should you decide to visit both. Roman Theatre: Next to the entrance to the Alcazaba is a well restored Roman theatre which is the earliest historical monument in Málaga. It was built in the first century AD, but later enriched to apparently luxurious effect with imported marble. After the fall of the Romans, there was a period of decline and instability from which there are no existing monuments. But significant parts of the Roman arena were used in the Alcazaba which sits directly above it. Málaga Cathedral: Right in the heart of the old town, just a short walk from the Alcazaba is the Cathedral which is the greatest of Málaga’s Christian buildings. The present structure has led a tortuous life. An early incarnation was abandoned and from this survives a wonderfully ornate Gothic doorway, now part of the Sagrario church on Calle Santa María, next to the Cathedral proper. The dramatic difference in the style of this door and the Cathedral, which was begun in 1526, reflects the huge shifts in culture in the early sixteenth century, as the Renaissance took hold in Spain. Work on the cathedral continued in fits and spurts for more than 250 years but was finally abandoned in 1782, as funding dried up in an increasingly desperate Spain. The building was left incomplete. Most notably, the south tower of the building was never constructed, leading Malagueños affectionately to refer to the building as ‘La Manquita’ – the one-armed lady. 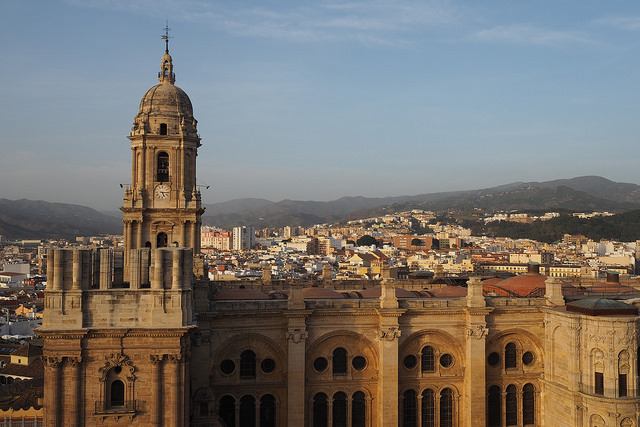 Picasso Museum: A short walk from the Cathedral brings us to the 16th century Palacio de Buenavista, a Renaissance Palace that now houses the undoubted jewel in Málaga’s cultural crown – the Picasso Museum. The twentieth century’s most celebrated artist was born in Málaga and lived here for the first ten years of his life. There are more than 200 Picassos on view and they cover most of his working life, from works painted when Picasso was just fourteen to those created at the very end of his life. It’s Málaga’s undoubted must-see museum. Around the corner is the church where the artist was baptised, the oldest in the city – the Santiago. Look out for its lovely doorway and tower, both in the Mudejar style – Muslim craft in a Christian context. Plaza de la Merced: Nearby is the Plaza de la Merced, the square most beloved by the people of Málaga. It was here that Picasso was born in 1881, and you can visit the Casa Natal, a small museum on the site of his birthplace, on the corner of a long and stylish nineteenth-century terrace. The square is also the site of an obelisk in honour of General Torrijos, a liberal who organised a small rebellion against King Ferdinand VII, only to be duped, immediately arrested and executed along with his companions on Málaga’s beach. From the Plaza de la Merced, walk back into Calle Granada, passing numerous distinguished eighteenth-, nineteenth- and twentieth-century buildings on the way to the city’s more official main square, the Plaza de la Constitucíon. Plaza de la Constitucíon: For centuries the square has been the site of all the main public events, from the infamous ‘autos-de-fé’ organised by the Spanish Inquisition, to fiestas and even bullfights, before the bullring was built in 1874. The balconies evident on the older buildings around the square were the prime spots from which to enjoy such events. A great place to absorb the atmosphere of this historic place is from the terrace of Café Central (Plaza de la Constitución 11). Turning west off the square takes you to the authentic old town of the city, with several churches hidden in its narrow, bustling streets. Los Martíres is an old Gothic church built to honour the city’s patron saints, third-century Christian martyrs Saint Paola and Saint Ciriaco. The church of San Juan, a short walk through more decayed streets, has some interesting and recently restored patterned murals, as well as a tower which is one of the city’s chief landmarks. Atarazanas Market: Another highlight is the nearby Atarazanas Market whose entrance, dating back to the fourteenth-century, was the gateway to the busy Muslim shipyard. A little way from the market is the Alameda Principal, Málaga’s eighteenth- and nineteenth-century promenade, on which you will find Casa La Guardia, the city’s oldest bodega, where you can enjoy the authentic sweet wine of the city, in an atmosphere that one imagines has changed very little since it opened back in 1840. Provided you’re reasonably fit you can see most of the highlights of Málaga on an independent walking tour. Just use the above notes together with a local street map to help find your way around. If you don’t think you’re fit enough just avoid the walk up to the Gibralfaro which is quite a steep climb. And if you’re really not keen on a walk you can hire a driver and tour guide for a private city tour. The Hop-on Hop-off Málaga Bus Tour isn’t necessary if you’re in reasonable shape but still proves to be a popular way to get around. Tickets can be booked at the above link and delivered to your mobile phone. The nightlife of Málaga is right up there as one of the best spots in Spain. That’s thanks to the hundreds of little bars scattered all over the city and especially in the old quarter around the cathedral. Malagueños love to go out and every night of the week seems lively as the locals make the most of their excellent year round climate and spend their evening sitting outside bars enjoying cold beers, local Málaga wines and a selection of deep fried fish tapas. Plaza de Uncibay is a good square to head for where you’ll find genuine old taverns buzzing with locals. Plaza del Obispo is also a good choice with open air terrace bars looking straight onto the facade of the cathedral. During the day you’ll almost inevitably stumble across Café Central on Plaza de la Constitución which is packed all day long with locals and visitors alike. Bodegas El Pimpi (Granada, 62): Truly atmospheric bar with a number of different rooms decorated with bullfight posters and paintings of Málaga. Popular with young locals and certainly worth searching for. Bar Lo Gueno (Marín García, 9): Old tavern bar packed with locals enjoying ice cold beers and plates of cured ham and cheese. Antigua Casa de Guardia (Alameda Central, 18) For sheer novelty value you must go to this old barrel bar which dates back to 1840 (some of the waiters in their white jackets look like they might have been there when it opened!). The place sells a selection of Málaga wines from the barrel and your bill is chalked up for you on the counter where you’re standing. Closes early so make it your first port of call or go during the daytime. Below the Cathedral in a small alleyway is the long standing former haunt of the poet Federico Garcia Lorca. A good range of popular Spanish dishes attract a local clientele. Around Málaga’s bullring is an area called La Malagueta where you’ll find what many locals consider the city’s finest restaurant. Café de París serves up traditional Andaluz dishes with a distinctively French influence. Leave space for the desserts. Not far from Café de París is the Refectorium where locals swarm after bullfights for generous helpings of solid Malagueño dishes such as grilled monkfish or roast lamb. Ardales – El Chorro Gorge – Antequera: The spectacular, yet relatively unknown, Garganta del Chorro lies to the south of the impressive Embalse del Guadalhorce inland from Málaga. It is a 4km long gorge with walls which reach as high as 400 metres. 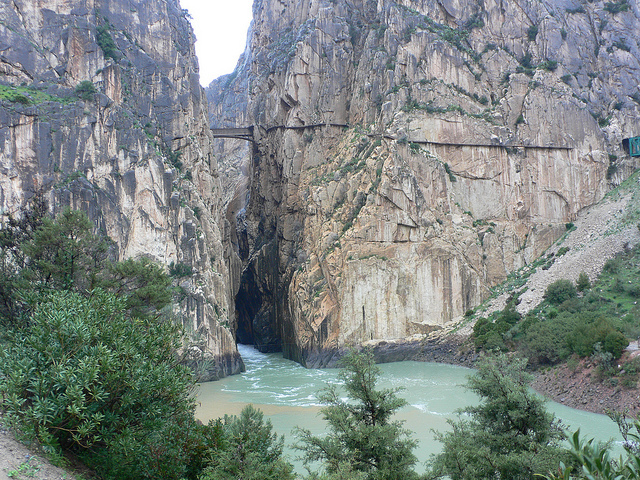 Along the walls of the gorge is the Camino del Rey, a footbridge which was built in the 1920s during the development of the reservoir system. It is named after King Alfonso XIII who walked its length when he opened these reservoirs. The walk is now operating as a tourist attraction that needs to be booked in advance. From Málaga take the 50km drive inland to the unspoilt village of Ardales where you can have a coffee in the village square amongst the locals. From here head to El Chorro via Bobastro which is the remains of a 9th century Mozarabic (Arabized Christian) settlement from where a Robin-Hood like character called Ibn Hafsun controlled an area extending from Gibraltar to Jaén. At El Chorro you can simply take a look at the Gorge from a distance or if you want to be more daring you can walk through several railway tunnels to get spectacular views looking from the railway line. If you’re ready for a lunch break try one of the nearby restaurants with beautiful views across the reservoir system. After lunch continue on to Campillos and take the main A 382 into the pretty Andaluz market town of Antequera. Here you will find numerous ancient monuments, fine churches and an impressive 19th century Plaza de Toros (bullfighting ring). After a stroll through the town to the ruined Alcazaba with its 13th century Islamic fortification you can take the main A45 road back into Málaga. As an alternative to Antequera you can visit the fascinating national park of El Torcal. 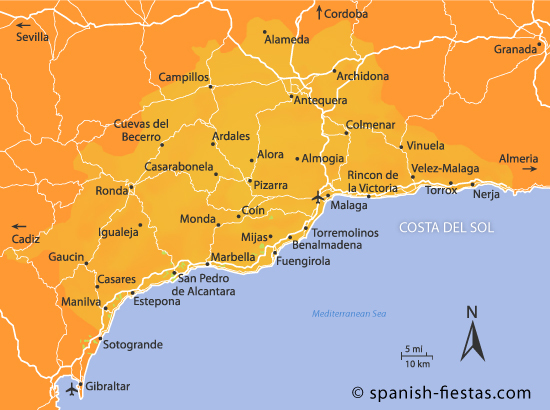 Marbella – Puerto Banus – Mijas Village: From Málaga it’s a 60km drive to Marbella heading southwest along the A-7. On arrival you should park your vehicle then walk to the partially walled Plaza de los Naranjos. The area surrounding the square now has many boutiques and restaurants but you can still find an authentic local bar and look up beyond the whitewashed alleyways to the mountains of Ronda. Now head 7km along the coast to the marina and casino complex of Puerto Banus. This is where wealthy individuals live in exclusive villas in the surrounding hills or lie around on phenomenally large and luxurious yachts in the port. Puerto Banus has plenty seafood restaurants and is a good choice for a lunch break. After lunch head back towards Málaga then rise several hundred feet above sea level to the quaint Andalucian village of Mijas Pueblo, which commands spectacular views right across the bay to Marbella. On a clear day you can see all the way across the Mediterranean to the north coast of Africa. In days gone by the donkey taxi was the only means of transport in Mijas and as you arrive in the main square you’ll see donkey taxi tours on offer to tourists. Alternatively, just stroll around the village’s cobbled streets looking at the tightly packed whitewashed houses with colourful geraniums hanging from balconies. A major attraction is the Plaza de Toros (Bullfight ring) which was built in 1920 and is one of the most unusual in Spain due to its rectangular shape. After a drink in a typical taverna located in Mijas’s central square head back down the hill to Málaga. For excursions which go further afield please be aware that the distances involved mean that you’ll have very little time to do justice to what are some of Spain’s great Moorish cities. These include Granada (125km), Seville (170km), Cordoba (160km) and Ronda (120km). More information about day trips appear on our Málaga Shore Excursions page.